By Luke Keighery, Ossu Friend and Committee Member. 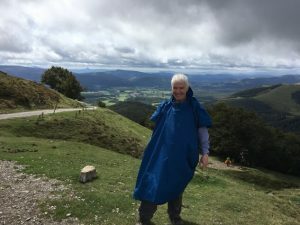 After enjoying my 800 km Camino fund-raiser walk and a week of R&R my homecoming was marred by the sudden onset of very painful stiffness in my hips upper thighs and shoulders. Painful at night and worst in morning or after sitting. Diagnosis: Poly Myalgia Rheumatica (PMR) a relatively common inflammatory disease in older people. Cause is unknown and not thought to be related to long distance walking such as the Camino. Treatment is with corticosteroids which I have now been on for 3.5 months. PMR has an excellent prognosis with prompt diagnosis and adequate therapy. Most patients require 1-2 years of therapy with slow tapering of doses to minimize risk of relapse. I am feeling terrific now and am well and truly back into walking yoga and whatever else. The fund-raising continues as I move into presentation mode with a few bookings already. The presentation includes a commentary on the Camino as well as the WaSH project in Ossu. I am looking forward to travelling to Ossu in March to review progress first-hand, so I can share the good news for the people of Ossu with all of you. Thank you once again to all our generous supporters. Should anyone wish to donate, the donation site continues at my WaterAid Fundraiser Page. Who are the Friends of Ossu? What is the WASH Project?